There are three types of Bekko: Aka (red), Shiro (white) and Ki (yellow) Bekko. Bekko has a simple pattern of sumi (black) against a red, white or yellow background. It is important that Bekko have a clear head with no black pattern. The sumi should be well balanced, symmetrically along the body. The fins can have some black. The bekko koi variety looks something like a Dalmatian, with small black spots over a solid base color. Unlike some Japanese koi varieties, bekko are not considered to be glorious or flamboyant fish, but they do offer their own style of simplicity and grace. Bekko: Solid body colored koi with black markings. Utsuri are often similar in appearance, but are black koi with single complementary color varieties. I like to think of Bekko as "Turtle" with markings on their backs only... unlike the Utsurimono whose dark body bands extend under/around the belly. Bekko heads should be free of black markings and the the same depth of color as the body. The black markings should be balanced symmetrically along the body of the Koi. A Bekkos' fins can have some black, as with Sanke. Aka Bekko: A red koi with some black pattern. Ki Bekko: A yellow koi with some black markings. 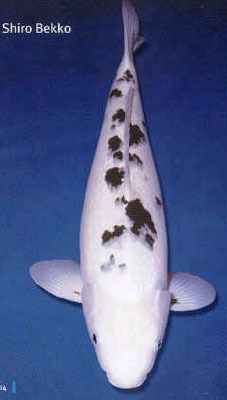 Shiro Bekko: A white koi with some black markings. BEKKO are white (Shiro), yellow (Ki) or red (Aka) base color koi with lacquered sumi spots on the back, like Sanke. Yes, the Japanese have several terms meaning red. 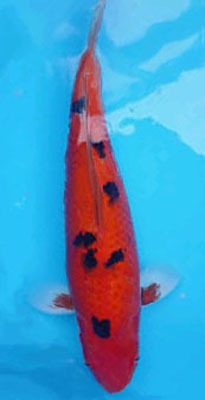 Shiro Bekko often result from Sanke breeding but are koi that never developed a red pattern or lost their red pattern. The most difficult and important thing with Bekko is to get a clear, unblemished head with no sumi pattern. The fins are the same as Sanke. Ki and Hi Bekko have the same problem as Utsuri in the tendency to get many small black spots but the sumi does not fade at shows like Ki and Hi Utsuri tend to do. Hi Bekko with this condition are referred to as pumpkin fish (not meant as a compliment). I believe Bekko are not valued because they are culls from Sanke breeding making them second-class. Their appreciation also suffers from not having a head pattern that Shiro Utsuri does have. The skin of the Shiro Bekko should be pure white. Many of them have a yellowish head which is undesirable. Also, the Sumi should be jet black. Aka Bekko have red, instead of white, base colour. Their Hi remains beautiful while they are one or two years old, but it tends to get lighter, as the koi grow bigger. The difference between the Aka Bekko and the Aka Sanshoku is often raised. No white parts are seen on the Aka Bekko, while some on the nose, the abdomen, or the tail joint are found on the Aka Sanshoku. The arrangement of Sumi markings between the Bekko and the Sanke is different too. Sumi markings of the Bekko are roundish and well balanced on both sides. A red koi with such Sumi markings may be regarded as Aka Bekko, if it only has a little white on the belly and only if it is not visible from above. Ki Bekko are yellow koi with small black markings, and good ones are rarely found. Well arranged, small, scattered Sumi clusters on a solid white, red, or yellow base are preferred. A large Sumi marking on either of the shoulders make a Bekko charming. Although a head Sumi is not necessary, if it does not mar the balance of the other markings, it is allowable. Isolated dots of Sumi are undesirable. Sumi strips are usually found on the pectoral fins, but some Bekko do not have them.